Please note that our Jackpot now stands at a Whopping €9,200. Now is the time if you are not already signed up to register. Not only are you helping your club but you are in with the chance of a great win. There was no Match 4 winner of the Club Lotto on Friday, 15th August when the numbers drawn were 3, 4, 11 and 17. It is €2 per week but goes a long way towards running all the facilities that we have. John McMahon gets the lucky dip. Further details are available at www.brayemmets.com. All club members are reminded that the Annual All Ireland Kick Fada will take place at Pairc Emmet Bhre, on Saturday 13th September 2014. This is the clubs biggest day where the top kickers in the GAA world ascend on Bray to try and get their name in to the records. It is also a day where children and parents alike will get to meet with these players. Please put the date in your diary and make sure you are part of making it a great day. 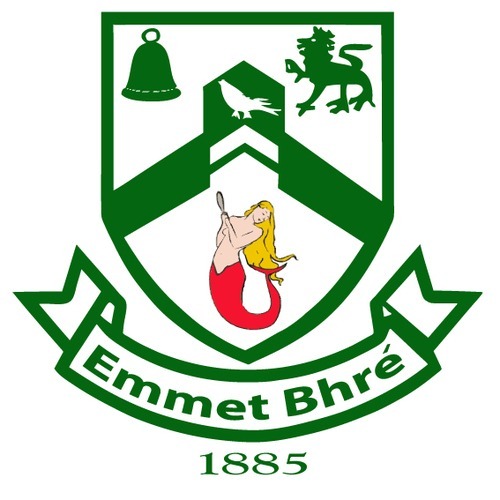 Emmet Bhré 2-26, Éire Óg 1-14. The Senior hurlers played Éire Óg Friday night, Aug 15th in Greystones. There were some very solid scores from play from a spread of players, coupled with a keen work-rate from a squad hungry for match day places. Serious challenges ahead however. Táimid go léir ag tnúth leis an gcéad lá eile. Foireann : Peter O’Reilly, Peter Walsh, Peter Kiely, Cathal Ó Dúlacháin, Karl Lacey, John Henderson, Jim Doyle, Dara Lohan, Diarmuid Masterson, Pádraig Doyle, Christy Moorehouse, Marc Lennon, Mikey Lee, Mikey Browne, Tom Cash. Dara Maloney, Ronan Cunningham, Luke Maloney, Cian O’Byrne. Bainisteoir – John Henderson Snr. Next Match in the Championship is Sunday 24th August in Aughrim at 1pm as we take on Carnew. Let’s keep behind them. Bray started well and within two minutes had the first score on the board. We played with the wind in the first half which was an advantage for our forwards who put up a score of 2 – 9 before the break. St Pat’s were no push over and had a score of 2 – 2 themselves. Bray came out in the second half determined that we could win. The strength of our defences line and skill of our mature players was to be the deciding factor in this game. Bray went on to score two goals and three points to St Pat’s two points in the second half. This Final on Saturday evening in Arklow was won by every girl from under 16 to senior who has played for Bray Senior Ladies this season. They have played well together as a team and their commitment to training every Monday and Thursday has been outstanding. I could praise the 20 girls lucky enough to play in this Senior B final, but that would not do justice to the rest of the squad who were unfortunate not to be picked and who turned up to cheer on their team mates. Well done to all the girls and we will get to celebrate together in the near future. We await the draw which is to be made on Monday night 18th August to find out who our next opponents are. We expect the match to be played on the last weekend in August. The U14 Camogie team travelled to Kiltegan on Mon 11 August. From the throw-in, Bray stole a march on the local girls. Jane Butler and Tricia Phelan played cleverly, creating openings for the free-scoring Erika Bellamy. By half-time, Bray had built up an impressive tally. This continued in the second-half, with Olivia Duffy and Grace Browne showing their ability. Bray continued their dominance until the final whistle, empowered by performances from Shauna O’Kelly, Nicole Ryan and Eimear Martin. Bhí Séamus agus Anne Carroll an-sásta leis an mbua. Foireann : Alannah Henry, Bróna Murphy, Eimear Martin, Erika Bellamy (2-2), Grace Browne, Laura Butler, Jane Butler (0-1), Allie Byrne, Eleanor Carroll-Hayes (0-1), Sarah Lambe, Olivia Duffy (0-1), Laura Butler, Lauren Healy, Lauren McKenna (1-0), Sasha Ní Laoghaire, Shauna O’Kelly, Rachel Rice, Tricia Phelan (1-0), Nicole Ryan. Bainisteoir – Séamus Phelan. Bray Emmets under 10 footballers produced a series of magnificent displays in the Fingallians Tournament, across their 5 matches against teams from Dublin, Meath, Down and Donegal. A comfortable win in their first group match was followed up by an incredible comeback in their second game, against St Sylvester’s. Trailing 3-4 to 0-1 at half-time, the players fought back with a determined display in the second-half, spurred on by a rousing motivational talk from team manager Gary Prunty. The team were beaten by a very impressive Ratoath team in their final group game, but the earlier results had earned qualification for a semi-final meeting with their Swords hosts. Again, it was the concentrated effort of the players in the second half that led to a win here, booking a place in the final against An Riocht from County Down. The scores were tied at a point a piece at half time, before Bray took the lead with a goal, during a torrential downpour, early in the second half. A victory, and first trophy for this group of players, appeared to be on the cards until An Riocht equalised following confusion amongst both teams, who mistakenly thought that the referee had blown his whistle for a free kick. He waved for the players to ‘play-on’, when the An Riocht forward kicked the ball into the net. Another goal followed less than half a minute later. Bray came close to equalising a number of times before the end, but the goal that they required alluded them. Overall, this was a great day out for the players, coaches, and the strong team of supporting parents. Bray Emmets squad: James, Adam P, Adam D, Cillian, Jamie M, Finn, Cathal, Kyle, Cian, Alex, Jack. The Under 13 Camogie team played Annacurra in Emmet Bhré on Friday Aug 1st. This was the B semi-final as we had previously suffered a narrow defeat against Carnew. The girls put in a great performance on Friday against a very strong Annacurra team. Laura McGarry took on the role of goalie for the first half and cleared some strong attempts by the Annacurra girls. Jordan O Brien and Neasa Ryder did a great job on defending the goal. In the half back line Eleanor Carroll Hayes and Alannah Henry made life quite difficult for Annacurra winning the ball and moving it up the field quickly and efficiently. Laura Butler and Leah Carroll dominated mid field getting lots of ball in to the forwards and getting some great scores themselves.Amy Butler, Sarah Lily Lynch and Catherine McGarry gave a great account of themselves in the forward lines. Orla Jackson played her part too and took over in goals in the second half and guarded the net well. The Annacurra girls played hard right until the end but ultimately the Bray girls were too strong for them. Final score Bray 14-3 Annacurra 1-1. Team – Amy Butler, Laura Butler, Eleanor Carroll Hayes, Leah Carroll,Alannah Henry, Orla Jackson,Sarah Lily Lynch,Laura McGarry, Catherine McGarry,Jordan O Brien,Neasa Ryder.